The bathroom can be one of the most dangerous places in the home. Most accidents that occur in the home are likely to happen in the bathroom. A good way to avoid all of these problems is better lighting. Installing new lighting fixtures in critical areas around the bathroom is a great way to avoid slip and falls or other injuries. Any bathroom can benefit from increased lighting that is designed to enhance clarity and decor. Get the most out of your bathroom today by installing everything from shower lights to decorative lighting fixtures. See the benefits immediately and increase both safety and bathroom appearance right away. One of the most popular methods to obtain a brighter bathroom is to install shower lights. 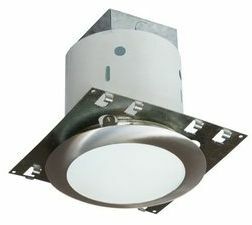 These are often a kind of recessed light above the shower area. This is a great idea for people that want increased visibility in the slipperiest area of the home. It makes sense to have more lighting in the shower. Standing or walking in a darken room can cause you to have a loss of balance because the body needs those visual cues for stability. Try standing on one leg and then close your eyes. You will notice immediately how your body trembles with the eyes closed. Prevent falls and make a shower more attractive by having these helpful lights. The lights can be anything from strong xenon or halide bulbs. They can even be made of bright LED bulbs that increase efficiency. All lighting is easily controlled and completely insulated for safety and convenience. Create a great look for any shower with the best shower lighting. Choose between direct or indirect lighting for your bathroom today. Many injuries are merely the result of not being able to see what is around you. The right lighting enables you to see stray water, avoid obstacles and have free movement. Improved bathroom lighting can be placed just about anywhere. Have it highlight the shower area and easily see where you are stepping or reaching. Do not forget about enhanced traction with shower treads. Treads are the perfect accessory to lighting systems. Have peace of mind every time you use a bath area or shower by taking advantage of new bathroom design that improves safety. Today’s bathroom lights are attractive and efficient. Many bathroom lights only use proven lighting systems that increase visibility while remaining efficient. LED bulbs are a rising star in bathroom lighting design. Many people enjoy LED bulb versatility for decorative uses. It also gives off a cool light that does not heat up small areas. LED bulbs also use less power and last longer than many other kinds of lights. Perhaps the best thing of all is that modern bathroom lights are maintenance free. Accent lighting is always a good idea for any bathroom. It is both decorative and functional at the same time. Help reduce the threat of bathroom injuries and highlight any area of the bathroom. Get focused lighting to spotlight important or darkened areas. Improve the appearance of your bathroom with vanity lights for mirrors or light bars for cabinets and sinks. There is no limit to what bathroom light fixtures can do for you and your family. Prevent falls and get a brighter bathroom today with bathroom lighting that never fails to impress.